HOLDERS Institute deservedly booked their place in the Eventsec NW Senior Cup Final after seeing off Ballinamallard United, at the Brandywell. 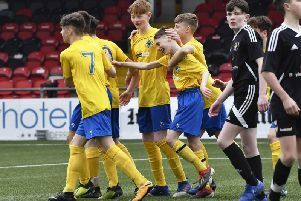 Both sides made a host of changes to their squads, but goals from Seamus Quinn and Jamie McIntyre, ensured Paddy McLaughlin's side face Limavady United in the final. The first real chance of the encounter came on 29 minutes as Duwayne McManus' right wing cross drew 'Stute keeper Ray Kelly from his line and while the keeper didn't get there, Nathan Cashel's powerful header from close range, was deflected wide by the net-minder. Moments later 'Stute went close themselves but after skipping away from a few challenges winger Callum Moorehead's strike from the angle was tame and easily gathered by United keeper John Connolly. The deadlock was broken on 37 minutes as youngster Seamus Quinn did well to get himself some space inside the box, before drilling the ball home from 12 yards, giving Connolly no chance. Minutes later the home side were inches away from doubling their lead as Jamie Dunne's left footed strike from just inside the box, which had Connolly beaten, flashed just wide. Soon after United should have levelled things but Aaron Arkinson's close range side footed strike, was straight at the grateful Kelly. Neither side created much in what was a disappointing second half, with United substitute Ryan Campbell going close to levelling things on 76 minutes, but the ex-'Stute man's shot on the turn flashed wide. Two minutes later Moorehead went close to adding a second but after racing clear, the winger blasted wide when well placed inside the box. Institute's skipper for the night Gareth Brown rattled the woodwork a minute later, as his right footed strike, which had Connolly beaten, came back off the post. That man Brown was in the thick of things again on 84 minutes but he headed over, after Moorehead's pinpoint right wing cross had picked him out. The woodwork came to the home side's rescue on 87 minutes as Sean McEvoy latched onto Richard Clarke's pass, but from a tight angle, his low drive smacked the post. In the closing stages both sides had chances with Cashel seeing his close range shot saved at the second attempt by Kelly and at the other end Dunne's low drive from 20 yards whistled just wide. Right at the death McIntyre sealed the win, as he broke the offside trap and coolly slotted the ball home past Connolly. Institute: Kelly, McGilloway, Quinn, Dunne, Curry, Moorehead, Morrow, Brown, McIntyre, Harkin, McCallion. Ballinamallard United: Connolly, Taheny, Arkinson (McIlwaine 74), McManus, Kelly (Clarke 83), Elliott (Campbell 64), Edgar, Cashel, McCann, McEvoy, Robb.